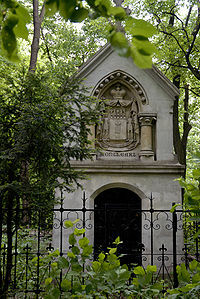 Am I obsessed with death, or just this crypt? Today, while doing some research for the Sisi blog, I came across this photo on the left and I couldn't get the image out of my head. Maybe because Steve Jobs died today; maybe because it's October, the month of ghouls and skeletons; maybe because I've been thinking a lot about what we leave behind, us writers and artists. I don't know, but all day long this mausoleum imprinted itself on me the way characters often do in prelude to embarking on a new project. I was born in the city where this mausoleum lives, five or so districts away from this homage to Wilhelmine and her husband, the Prince of Montleart. When I look at this picture there is something spookily reminiscent. Like maybe I was rolled by it in my pram or perhaps I trundled alongside it on my way to school. I'm guessing it's the wrought iron gate that looks so familiar. Vienna is big on iron curlicues. Next summer when I do my lemming-salmon-return to the scene of the crime, I want to stay in the adjoining castle-turned-bed-and-breakfast. I have this fantasy that, first thing one morning, I'll skip out into the forest dressed in white gauzy nightgownish material and rub up against this gothic mini-schloss. Like a bear rubbing its back against tree bark. Maybe it's all these 50-something people that keep dropping dead of horrible diseases. Maybe it's that nobody gets to be laid to rest in structures like these anymore. Maybe it's that I still believe the fairy tale. Hey, Steve, here's to staying hungry and foolish. RIP. steve jobs passing has affected more so than i anticipated. i saw it online last night and my eyes welled up enough that my husband thought something bad had happened to someone we knew. it's not the passing of the person for me, but the loss of another rock star. a force our world needed like water. i like crypts and cemeteries. Hi Amy, perceptive one. I think this particular crypt is sort of like that "death" tarot card. Bespeaks transition. I guess the overall message I keep getting these days is the need to live an authentic life before it's too late. Listen to your own voice, etc... which was Jobs' calling card. So. RIP then, Mr. Jobs. See you in the forest.